Sister Eleanor Pierre Caterall, S.S.J. 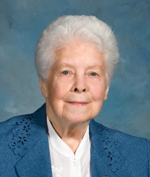 Sister Eleanor Pierre Caterall, S.S.J., died Sept. 22 at St. Joseph Villa, Flourtown. She was 101. Daughter of the late Francis and Mary Anne Catterall, she was born in Kearney, N.J., and attended Our Lady Queen of Peace Grade School and High School in North Arlington, N.J. She entered the Sisters of St. Joseph in September 1935 and professed her final vows in August 1943. Sister Eleanor ministered in the archdioceses of Philadelphia, Baltimore and Newark. The funeral Mass was celebrated Sept. 26 at St. Joseph Villa. She is the sister of Francis, John, William, Thomas, Aloysius and Sister Francis Thomas Catterall, S.S.J. Aunt to Nancy, John, Francis Catterall and Maureen McDonald, she is also survived by grandnieces and grandnephews and members of her Congregation, the Sisters of St. Joseph. Donations in Sister Eleanor’s memory may be made to St. Joseph Villa, 110 West Wissahickon Avenue, Flourtown, PA 19031.